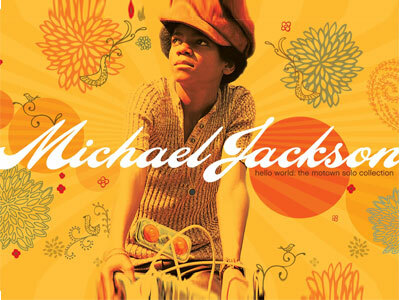 The world celebrates Michael Jackson's 51st birthday with Hello World: The Motown Solo collection, a new three-disc compilation set on a limited run. Scattered across the three discs are 69 hard-to-find MJ Motown songs such as "Ain't No Sunshine," "My Girl," "You've Really Got a Hold on Me," and "Ben." Of the 69, 9 are unreleased tracks that include undubbed mixes of some of the songs that also appear here. Michael Jackson's take of the Edwin Starr classic "Twenty Five Miles" has been thoughtfully added, too. And then there's the part that will tickle collectors everywhere: the book. Fifty pages of rare photos, LP jacket reproductions, and the original rare "rat" cover of Ben. Motown's Suzee Ikeda takes care of the introduction, while Professor Mark Anthony Neil, Professor of Black Popular Culture at Duke University and a favorite commentator at National Public Radio, writes the main essay. The Philippines gets a limited number of copies so to quote another dead hero, Janis Joplin, get it while you can.